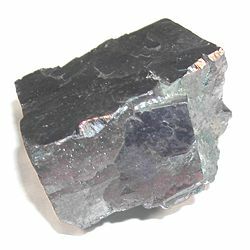 Galena is the natural mineral form of lead sulfide. It is one of the most abundant and widely distributed sulfide minerals. It is the most important lead ore mineral. It is also an important source of silver, which is often found in the mineral. It was once used as the semiconductor (or "crystal") in crystal radio sets. 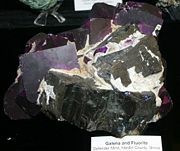 Galena is often associated with the minerals sphalerite, calcite, and fluorite. Galena deposits often contain significant amounts (up to one percent) of silver as included silver sulfide mineral phases or as limited solid solution within the galena structure. In addition, zinc, cadmium, antimony, arsenic and bismuth also occur in variable amounts in lead ores. Selenium substitutes for sulfur in the structure constituting a solid solution series. The lead telluride mineral altaite has the same crystal structure as galena. Within the weathering or oxidation zone, galena changes to anglesite (lead sulfate) or cerussite (lead carbonate). Galena deposits are found in France, Romania, Austria, Belgium, Italy, Spain, Scotland, England, Australia, and Mexico. Noted deposits include those at Freiberg, Saxony; Cornwall, Derbyshire, and Cumberland, England; the Sullivan mine of British Columbia; and Broken Hill, Australia. Galena also occurs at Mount Hermon in Northern Israel. In the United States it occurs most notably in the Mississippi Valley type deposits of the Lead Belt in southeastern Missouri, and in similar environments in Illinois, Iowa and Wisconsin. Galena also was a major mineral of the zinc-lead mines of the tri-state district around Joplin in southwestern Missouri and the adjoining areas of Kansas and Oklahoma. Galena is also an important ore mineral in the silver mining regions of Colorado, Idaho, Utah and Montana. Of the latter, the Coeur d'Alene district of northern Idaho was most prominent. Galena is the official state mineral of the states of Missouri and Wisconsin. Galena has practically the same crystal structure as halite (sodium chloride, NaCl). It crystallizes in the cubic crystal system, often showing octahedral forms. In addition, it is a semiconductor with a small bandgap of 0.4 electron volts (eV). One of the earliest uses of galena was as kohl, which in ancient Egypt was applied around the eyes to reduce the glare of the desert sun and to repel flies, a potential source of disease. Galena is now the principal ore of lead. Also, given the large quantities of the mineral that are processed, argentiferous (silver-containing) galenas have long been the most important ore of silver. In addition, in the early days of wireless, it was used as the semiconductor (or "crystal") in crystal radio sets. Combined with a safety pin or similar sharp wire known as a "cat's whisker," the galena crystal became part of a point-contact diode used to detect radio signals. Mindat.org. 2007. Galena. Mindat.org. Retrieved April 10, 2007. Mineral Gallery. 2006. The Mineral Galena. Amethyst Galleries. Retrieved April 10, 2007. Mineral Gallery. 2006. The Galena Group of Minerals. Amethyst Galleries. Retrieved April 10, 2007. This page was last modified on 18 May 2017, at 14:53.